MONTREAL, Dec. 19, 2018 /PRNewswire/ - GardaWorld, the largest privately-owned business solutions and security services company in the world, has launched the 2019 Global Mobility Risk Map, adding further depth to its global travel security services. The development and launch of this new tool, which will assist organizations to fulfill their duty of care towards employees traveling abroad, was made possible in part by GardaWorld's Crisis24 analysts team, as well as its previously announced strategic alliance with IHS Markit, a global leader in country risk intelligence and forecasting. GardaWorld continues to strengthen its expertise in country risk assessments, crisis management and response to the benefit of its diverse clientele, while reinforcing its position as a global leader in the security sector. 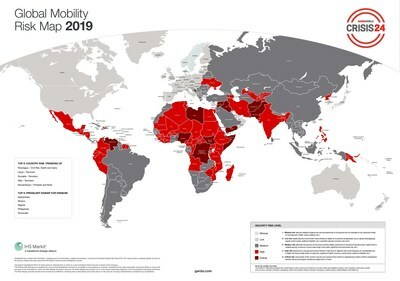 With the Global Mobility Risk Map, employers now have a comprehensive global view of all potential travel security risks at their fingertips, so that they can properly prepare and mitigate risks for their business travelers. This newest tool is part of GardaWorld's commitment and approach to duty of care—coined "Duty of Care 2.0". The company offers comprehensive travel security services that cover corporate travelers from the moment a trip is planned, to the moment they return home. "This Global Mobility Risk Map is backed by intelligence from our own Crisis24 team of analysts and IHS Markit. It is based on proven threat assessment, vetted and up-to-date incident data and geopolitical analysis," said Stephan Malvoisin, GardaWorld's Managing Director, Crisis24, Travel Security and Response. "Duty of care in today's complex world is a foremost priority for both private and public sector organizations whose people need to travel safely around the world. GardaWorld's objective is to provide organizations with the tools, services and support they need to fulfill that duty." The map highlights the key issues and most volatile areas to watch out for in 2019. It takes into account unrest in western countries due to widespread perceptions that politicians are failing to adequately address increasing economic and social inequalities; the continued threat of large-scale terrorist attacks worldwide and the rise of far-right incitement and violence in Europe and North America; the high risk of cyberattacks targeting both government and private sector services, such as health, telecommunication and transportation providers; an intensification of natural disasters as temperatures and sea levels continue to climb; and political unrest due to upcoming elections in Senegal, Ukraine, Afghanistan and India. GardaWorld's expertise in security-related intelligence, crisis management and response, as well as its comprehensive range of other security and protective services, make GardaWorld a true one-stop shop for securing people and assets across the globe. GardaWorld is the world's largest privately-owned security services company, offering cash services, physical and specialized security solutions and, with the Crisis24 portal, the dissemination of vetted information related to international security. A partner of choice for private companies, governments, humanitarian organizations, and multinationals with personnel all over the world, GardaWorld employs more than 65,000 highly skilled, dedicated professionals who serve a diverse clientele in North America, Africa, Asia and the Middle East. In the complex world we live in, our reputation is based on the quality of our services, as well as the commitment and integrity of our people.